Commissioned for the book published at the occasion of the exhibition Cycles of Collapsing Progress, Tripoli, 2018, curated by Karina el-Helou with the collaboration of Anissa Touati. Commandée pour l'ouvrage accompagnant l'exposition Cycles of Collapsing Progress, Tripoli, 2018. Commissariat: Karina el-Helou avec la collaboration d'Anissa Touati. On June 6, 1939, authorities of the French Mandate in Lebanon and Syria dedicated Beirut’s airport. Built on sandy grounds in the southern outskirts of the city, it was equipped with a passenger terminal, air sheds and a control tower.After World War II, as the development of air transport required larger structures, a newer airport was to be built in Khaldeh. In order to ensure its funding, the government decided to parcel out the grounds of the first airport on the real estate market. In consequence, after the opening of the new Beirut International Airport, on April 12, 1954, the previous one was immediately demolished. The commemorative plaque was dismantled and put aside. 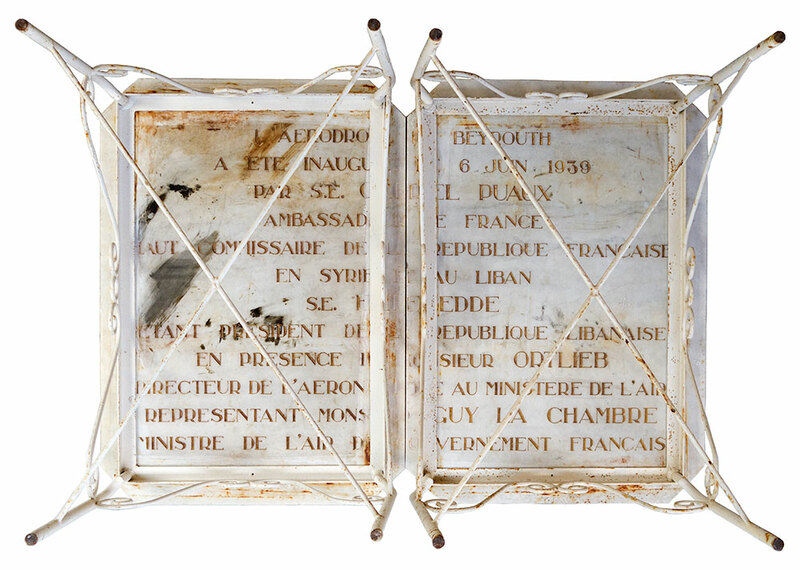 Ultimately, the plaque re-emerged, cut in two parts and converted in two table tops, being the only physical remains of Beirut’s first airport. Inscription: “L’AERODROME DE BEYROUTH / A ETE INAUGURE LE 6 JUIN 1939 / PAR S.E. GABRIEL DE PUAUX / AMBASSADEUR DE FRANCE / HAUT COMMISSAIRE DE LA REPUBLIQUE FRANÇAISE / EN SYRIE ET AU LIBAN / S.E. EMILE EDDE / ETANT PRESIDENT DE LA REPUBLIQUE LIBANAISE / EN PRESENCE DE MONSIEUR ORTLIEB / DIRECTEUR DE L’AERONAUTIQUE AU MINISTERE DE L’AIR / REPRESENTANT MONSIEUR GUY LA CHAMBRE / MINISTRE DE L’AIR DU GOUVERNEMENT FRANÇAIS”.